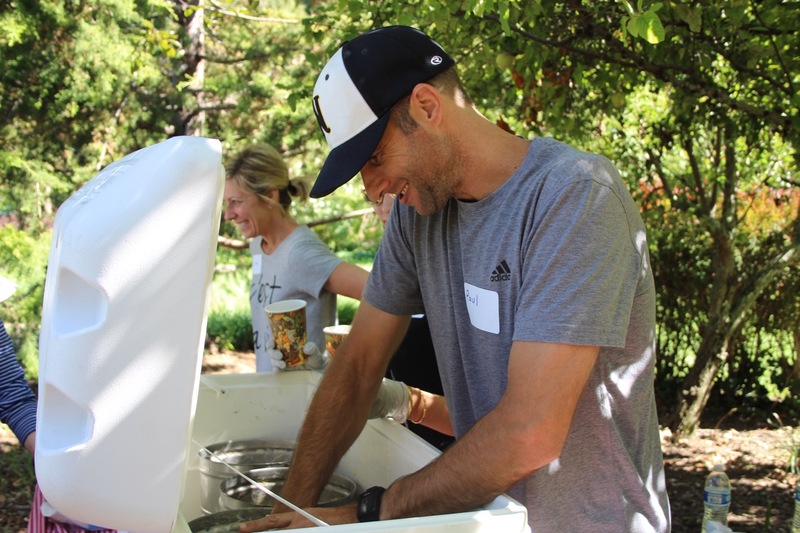 The Dominican Neighborhood Summer Scoop was a resounding success with over 10 gallons and about 186 scoops of ice cream served. 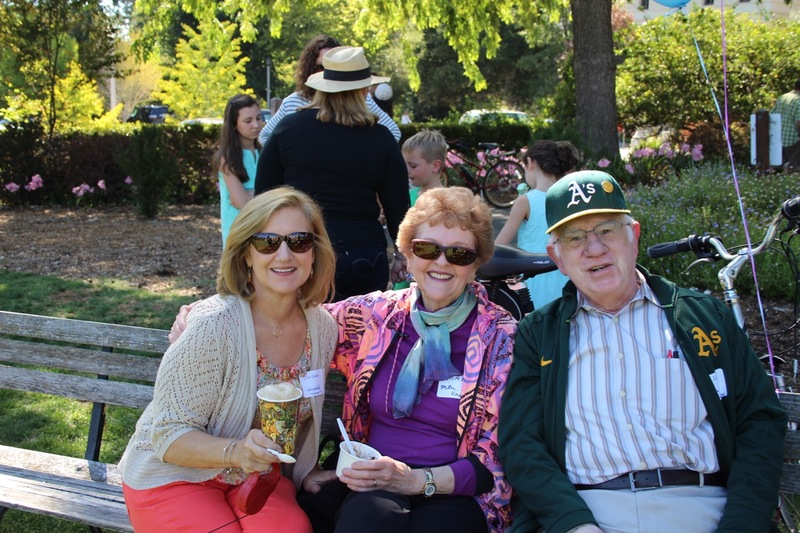 While mint chip was the most popular ice cream, the root beer floats proved to be a big hit. The event was chaired by Dominican Black Canyon Neighborhood Association Board member Arline Van Gessel. Lots of details, well managed, led to a successful afternoon for all. A selection of photos below, but there are more on our Facebook page! The ice cream, supplied by Silbermanns in Northgate arrived at Meadlowlands lawn at -10 degrees, which provided a challenge early on for our master scoopers, Gina and Paul Podwojksi and Zohraa Rehman. Kudos to the team for their two hours of scooping! And congratulations to the six raffle winners of $10 gift certificates to Silbermanns. 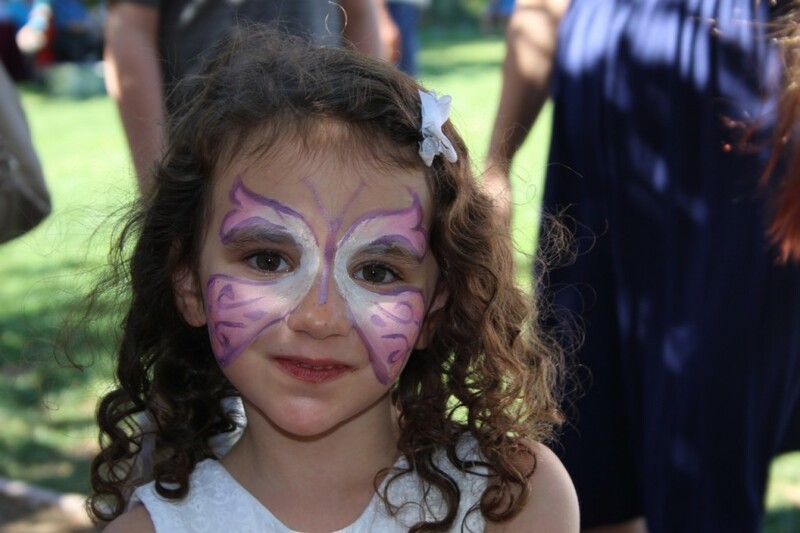 Face painting specialists Debbie Ward, Sara Sonnet and her two daughters, Penelope and Isabelle all contributed to one of the most popular events at the Scoop. 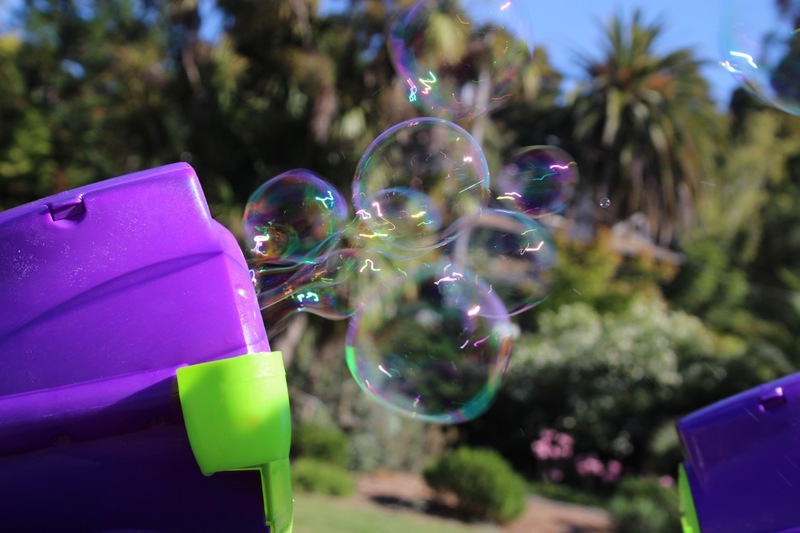 Dennis deMille, Vice President of the Board managed the amazing Hurricane bubble machines and the fantastic 50s music! Jack Nixon, Board President and fellow Board member John Matulich manned the membership table to welcome and encourage neighbors to join the neighborhood association. 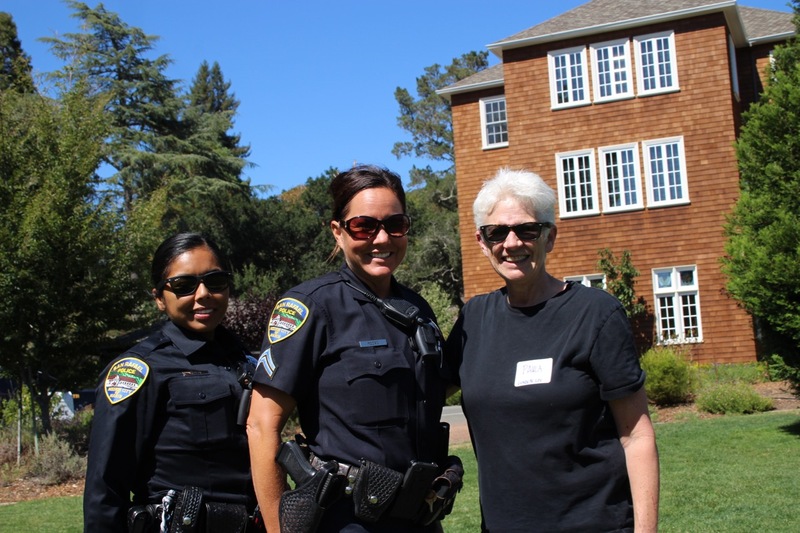 We had the pleasure of a visit from San Rafael Police Department Corporal Ronda Reese and our newest SRPD Officer, Sandra Felix. 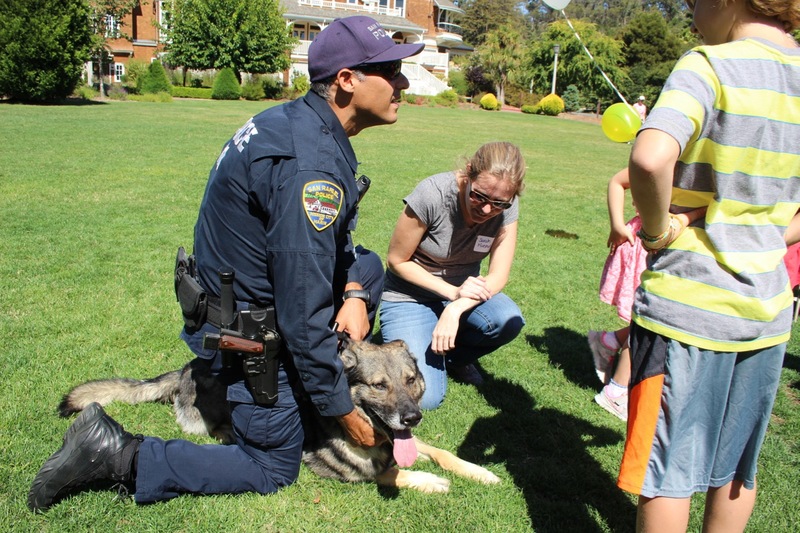 Officer Christian Diaz, of the K9 unit brought Faro with him, who was a big hit with both neighbors and the kids. Also attending were Vice Mayor Kate Colin, City Council members Andrew McCullough and Maribeth Bushey. Supervisor Damon Connolly rode his bike from Terra Linda to get something cold to drink! 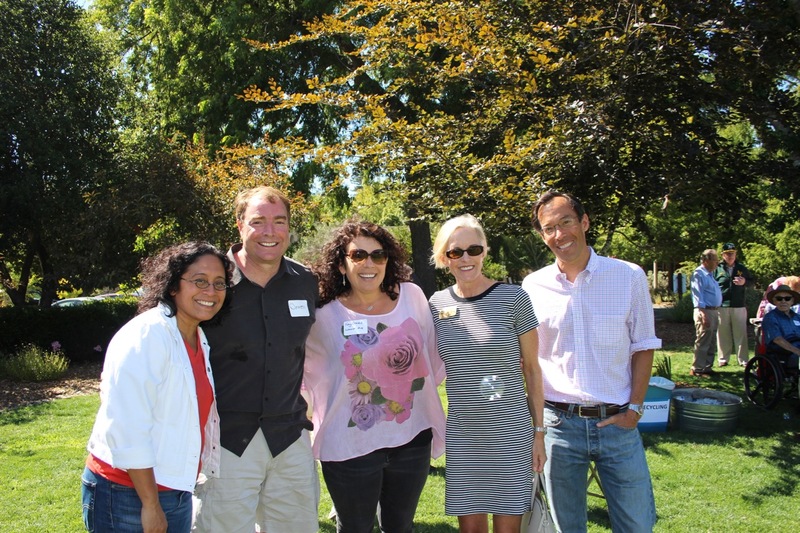 Hanna Rodriguez-Farrar (far left in photo below) from Dominican University joined us and we thank her and the University for their generous offering of this fantastic venue. Neighbors just had a good time talking and eating! 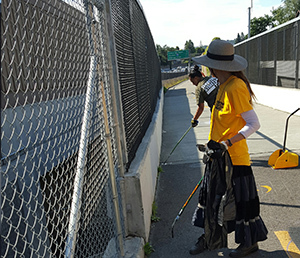 In response to a neighbor request, the Downtown Streets Team came over and cleaned the overpass/bike path students walk every day. And a shout out to the Department of Public Works, who cleared the fenced area across from Coleman Elementary School. The homeless used to break into this fenced area and camp. 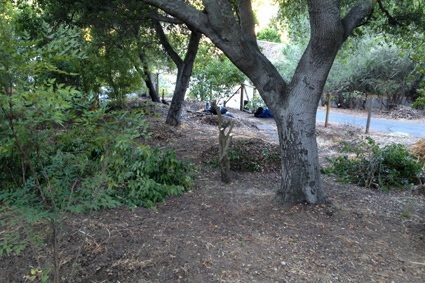 After repairing the fence about three times, Kate Colin, Vice Mayor of San Rafael, got Cal Trans (their property) and DPW on board to erect a taller, stronger fence and clear the area of shrubs and weeds to make it less desirable. That worked! Now it is all cleared! Thank you Downtown Streets Team!! Whether it is for emergency communication or crime alerts, we need a way to communicate to the Dominican neighborhood. What better way than a private Dominican area social media site? That is NextDoor.com! 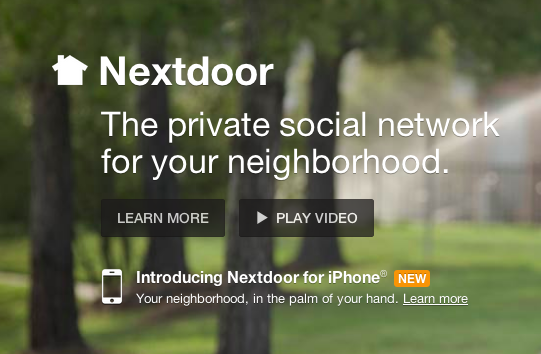 NextDoor.com is a social media site designed for neighborhood communications. Based in SF, this site provides a Facebook-like interface to post comments, events, crime alerts, and even classified ads to be viewed by our neighbors. Not anyone can get access to our site–to join you have to verify your address is within the boundaries established for the neighborhood. You can do this by giving them your cell phone number. Verification takes seconds. 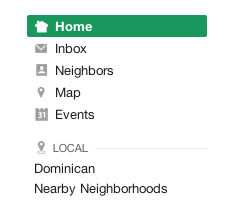 You can also get access to the Dominican NextDoor site by being invited. So once you get in, invite your neighbors! 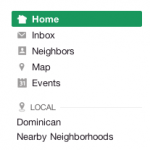 When you are in the site, you will see in the left hand column an option to view and post in Dominican and in Nearby Neighborhoods. If you want to ONLY communicate to our neighborhood, just click Dominican and all your posts will go there. It is easy. So you don’t want more email notifications when people comment on your posts? 1. There is a drop down menu under your name in the top right corner. Choose Settings. 2.In Settings, click on the email tab. 3. There is a chart (see below) that includes the option of Dominican or Nearby Neighborhoods and all the categories such Crime & Safety, Lost and Found, etc. You can choose to receive immediate notifications, a daily digest email, or no notifications. 4. We suggest that you leave the alert ON for Crime & Safety. Additionally in Settings is a Mobile Alerts tab. This is where you can put your mobile phone in for immediate urgent alerts which would be about crime & safety issues. We suggest you do this as well. 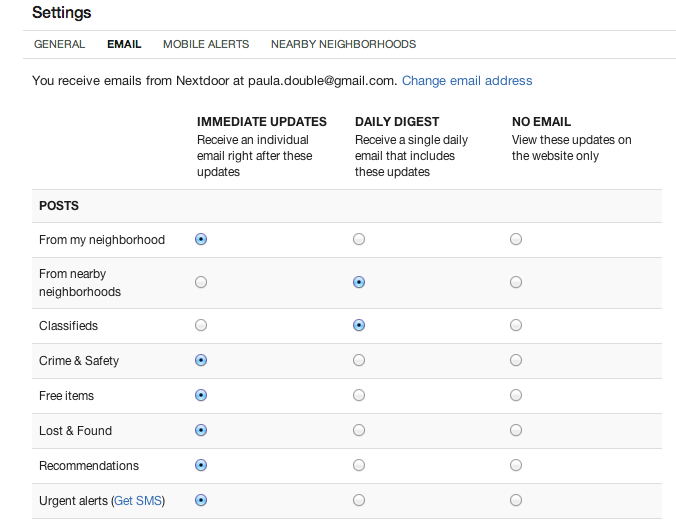 Go visit NextDoor.com and browse through the information, frequently asked questions, and view the video tour. If you want an invitation for access, just send us an email at DBCNA.info@gmail.com. You should be receiving your Traffic newsletter over the next week. If you did not receive a newsletter by Sunday October 5, send us an email and we’ll get one to you. You can also download a pdf of the newsletter here. When a speeding car killed a resident’s cat on Dominican Drive, it led a group of concerned neighbors to form a Traffic Committee to discuss the issues. Our goal is to raise awareness about our driving habits, consciously slow down and stop at stop signs. This is something that we, as a community, can change if we want. Please participate by putting a sticker on your car window and a lawn sign in your yard. If you need a sticker for a second car or are willing to put up a sign, send an email to DBCNA.info@gmail.com. Excessive speeding on Dominican Dr., Mountain View Ave, Grand Ave, Belle Ave., Villa Ave., Rafael Dr. and Locust Ave.
People run stop signs at Sienna at Mt. View, Mt. View at Grand, Grand at Villa, Irwin and Belle. It is dangerous walking down Mountain View because there are no sidewalks on the last few blocks near Grand Avenue. This is a big and dangerous problem for children walking or biking to school, and for famlies with children in strollers. Speeding on Belle Ave near Coleman after dropping kids off in morning or before picking them up. Parking in neighborhood without respect for blocking driveways while picking up kids at Coleman. Driving around pedestrians in crosswalks. Nader Mansourian, Director of Public Works for the City of San Rafael, attended our second traffic meeting and talked about the process for new signage, and the extensive rules and regulations required to governing the approval of new signs. Nader explained that he comes out to Dominican every few years to respond to the same series of complaints. He researched the accident reports for our area and our neighborhood has few vehicle impacts on record. The City of San Rafael has monitored speeds on Mt. View a number of times since 2000. The average speed has risen from 32 mph to 34 mph, in a 24 mph zone. Signage: Many traffic studies have shown that adding more frequent 25 mph speed limit signs is not effective in slowing traffic or changing people’s behavior. People simply stop seeing them. Speed Humps: The City of San Rafael no longer installs speed bumps as they significantly slow down response time for emergency vehicles (ambulances have to come nearly to a complete stop at each hump), but they also do not slow traffic. Traffic studies show that once over a bump, people tend to accelerate even more due to the annoyance. Stop sign at Villa: California Vehicle Code would not allow a southbound stop sign on Grand Avenue at Villa for several reasons. Among them, the traffic on the two streets is not nearly equal, a requirement for a three-way or four-way stop. For another, the hill just north of that intersection would hide any sign from traffic driving south, until the cars are suddenly upon it and unable to stop fast enough. Additionally, having the sign would give cars entering from Villa an inappropriate sense of security, when they expect southbound cars to stop. We are pursuing discussions with him about other possible signage that might slow traffic. We will keep you updated on the process. In an effort to increase awareness, we have distributed 1000 traffic newsletters and window stickers to the neighborhood. We have lawn signs that will be placed in yards and moved from house to house every few weeks to increase visibility. Dominican University is distributing over 425 window stickers to students with parking permits and employees., in addition to University-specific lawn signs that will be posted on campus. The vote on SMART quiet zone horns will be held in December. Read more at www.WeAreSanRafael.com. At the end of 2016, SMART will be rolling down the tracks. 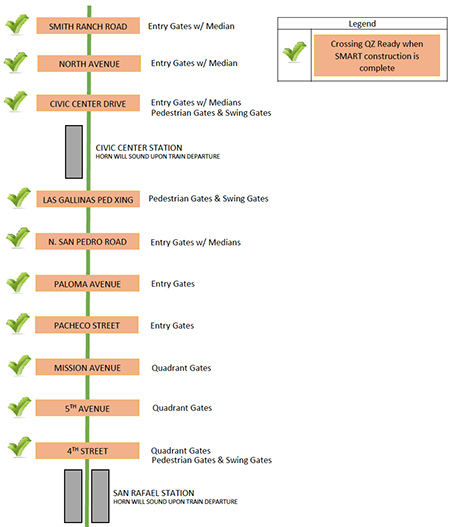 Trains will be passing all grade crossings in San Rafael from 5:30am to 8pm weekdays and also on a weekend schedule. This four times an hour for 14 hours a day. The HORNS MUST SOUND at 96-110 decibels (very loud) approximately ¼ mile before every grade crossing. Hundreds of homes and apartments will experience significant noise impact. Quality of life for many residents living close to the SMART train corridor will be diminished. The City of Richmond has the largest network of quiet zones in the state for 10 years with no problems. We can do this too. The City of San Rafael is in the process of considering a Quiet Zone for San Rafael. If a Quiet Zone is introduced with adequate safe guards and safety measures (SSMs), residents will not be subjected to train horns at grade crossings. This will make a huge difference. Please note that design and construction is already planned and budgeted to make ALL crossings Quiet Zone-compliant. All that needs to happen is for the City Council to vote their intention to have quiet zones. The City of San Rafael will conduct the last of three meetings on September 29, 2014 – 7-9pm, Terra Linda Community Center. Please attend and voice your opinion on this subject. What happens if there is no Quiet Zone? Train operators are required by law to begin sounding their horn 15–20 seconds before entering a public road or pedestrian‐rail grade crossings and no more than one‐quarter of a mile in advance. Because of the close proximity of crossings in San Rafael it will result in the train horn sounding continuously. Experts estimate that 90 percent of train noise comes from blowing the train horn at the mandated 96 to 110 decibels. SMART, in their 2006 EIR, reported that at least 280 homes and apartment buildings in San Rafael would experience severe noise impact and 540 homes and apartments would experience significant noise impact. Many residents believe their reporting number is low. A railroad engineer always retains the right to use the horn if there is any potential danger on the track (a car or pedestrian encroaching on the track, for example). To see all planned Quiet Zone-compliant crossings on the SMART train line, download the Quiet Zone Safety Measures pdf published by SMART. SMART released this document in 2012 which includes information about what Quiet Zones are, what types of crossings are compliant. Bottom line is that if there are no train horns, it needs to be apparent that a train is coming through closed gates that are not passable. Click to view the Establishing Quiet Zones in the SMART corridor pdf from SMART. Only local public authorities with control over streets and roads (such as cities or counties) may establish quiet zones. The establishment of a quiet zone does not require the submission of an application to the FRA and thus there is no need for a local jurisdiction to wait to see if its quiet zone has been “accepted. 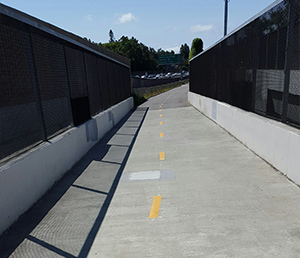 The process begins when a local jurisdiction, such as the City of San Rafael, files a Notice of Intent to establish a quiet zone to the California Public Utilities Commission, Caltrans and applicable railroads (in this case SMART and the NCRA). While the Federal Railroad Administration (FRA) is not required to be part of the notice of intent process, it is prudent to keep them involved in the process. The issuance of this notice is typically preceded by a formal diagnostic review of crossings in the proposed quiet zone. The PUC, railroads and Caltrans must be invited to the diagnostic review. This diagnostic review is necessary to determine treatments for pedestrian crossings and private crossings that involve public access, industrial activity or commercial activity. The review is also intended to assist the local public authority in devising the best plan for quiet zone implementation. (Note: According to Ken Chiang at the CPUC this had been conducted but SMART has not yet submitted its official requests). Once any necessary supplemental safety measures have been installed, and the CPUC has verified Quiet Zone Calculator data, the local public authority issues a Notice of Establishment. The Notice of Establishment is sent to the FRA, all applicable railroads, Caltrans, any local governments affected and any private property owners affected by private crossings. Railroads must cease blowing the train horns after the 21-day waiting period. (Note: Ken Chiang at the CPUC is of the opinion that local jurisdictions should consider waiting 6 months to one year after SMART service initiates to consider implementing quiet zones. In the case of the SMART corridor, quiet zones could be established and improvements incorporated into SMART’s construction prior to service startup. 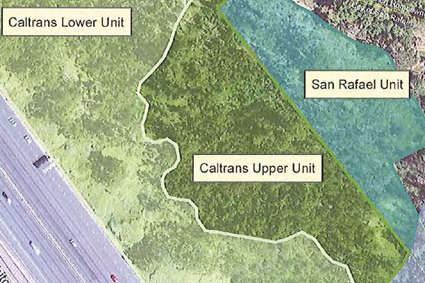 The PUC has the right to make a recommendation on quiet zone implementation in San Rafael. The word is that they are going to suggest a 6 month-1 year use of horns to ensure people KNOW a train is in town…before implementing a quiet zone. This approach is counter-productive. If people get used to hearing horns, and then the horns are gone, people who relied on the horns will be at increased risk. According to the FRA’s Staff Director of the Highway Rail Crossing and Trespasser Division, the failure of a train to sound its horn should not be a cause of action against a local jurisdiction that implemented the quiet zone. The same official has publicly stated that if a suit is ever brought against a local jurisdiction for preventing horns at a crossing, the FRA would likely file an amicus brief on behalf of the locality. The FRA does not want local jurisdictions to be punished for creating quiet zones, since adherence to FRA requirements should translate to an overall reduction in safety risks. Unlike some older quiet zones established with whistle bans before the 2005 Train Horn Rule, new quiet zones can only have been implemented if overall safety risks were reduced to the a level at or below that with trains sounding their horns; or if risk were negligible with or without the horn. Ultimately courts determine liability and culpability based on the particular circumstances of individual cases. The Mayor is concerned about indemnification. What have other cities done and what is SMART’s position? SMART in an email exchange with Ken Dickinson August 4, 2014 has gone on record as saying that “SMART’s standard indemnification regarding quiet zones will be developed and tailored for each of the jurisdictions as required.” But no actual standard has been forthcoming from them at this time. The FRA has noted that states have the power to exempt local communities from lawsuits through the application of sovereign immunity (and some states have chosen to do that). Source: CRS Report for Congress – The Federal Railroad Administration’s Train Horn Rule, April 20, 2007. Fire Chief Christopher Gray provides an update on fire risk mitigation. 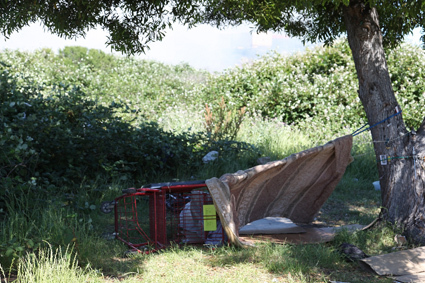 This fortunately includes Puerto Suello Hill which has been the site of numerous, recurring homeless camping. Growth of eucalyptus trees and their understory have created a fire risk in various areas of San Rafael and Marin County. One prominent eucalyptus forest and broom area is located on Puerto Suello Hill along the east side of Highway 101. A portion of this are received fuel reduction in 2009. Over the past several years, we have been working to remove or significantly mitigate the accumulated fuel in this area. 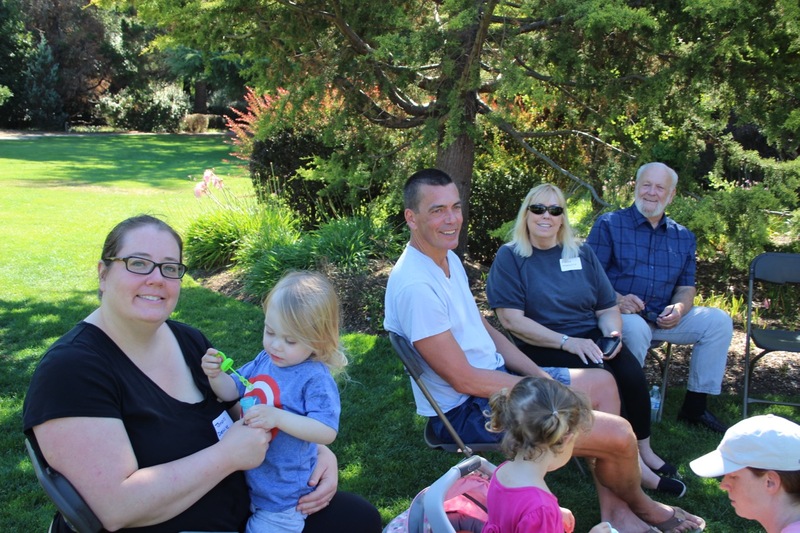 Earlier this year, several agencies (Fire Safe Marin, PG&E, Caltrans, MMWD, Marin County Fire, the Laurel Glen Homeowners and City of San Rafael) worked together to take advantage of funding that became available through the PG&E Drought Emergency Fire Fuels Fund. Fire Safe Marin acquired the base funding for the project in the amount of $30,000. Proper notifications and approvals have occurred. The City of San Rafael and Caltrans are also contributing $5,000 each to cover the total cost of the project. 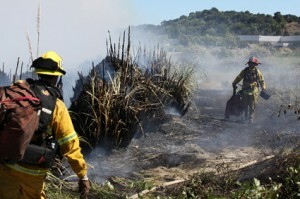 The Marin County Fire Tam Crew is doing the actual work. Preparatory work on the site began yesterday and fuel reduction efforts will continue over the next several weeks. 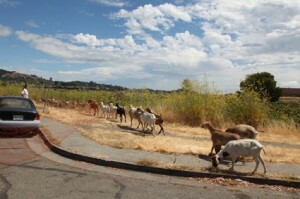 Additionally, the goats recently wrapped up their effort at Canalways and are now working with San Rafael Public Works in some drainage along the 580. 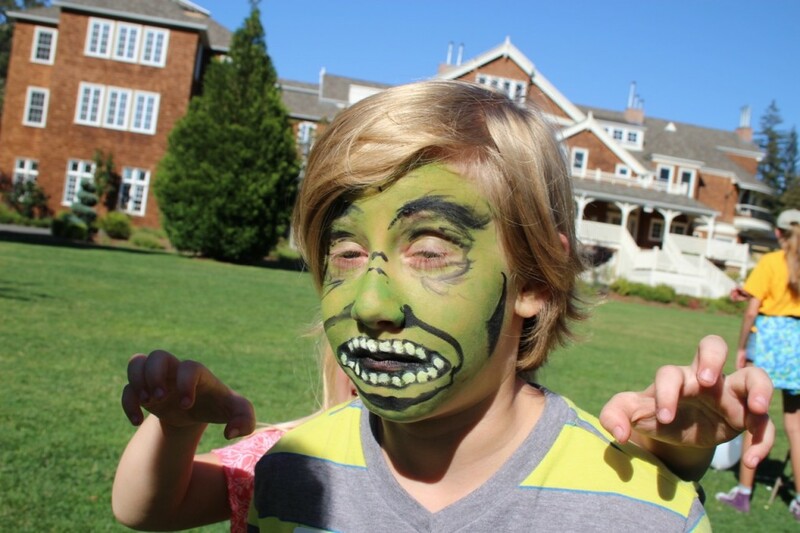 Next, they will be “chowing down” in four other trial areas of the community: San Rafael Hill, Gerstle Park, Peacock Gap and Canyon Oaks. Maps of the trial areas are attached. The work area of San Rafael Hill is being expanded to include Robert Dollar Scenic Drive and behind Boyd Park/Elks and Falkirk. So far, so good. Read an update to the goat progress here. The San Rafael Fire Department has hired a herd of goats to clear the vegetation in the Canalways area near Target/Home Depot. Over 300 goats arrived on Tuesday, July 22 at the test plot and we will track their progress over the next couple of days. Goats R US, the owners, will remain on the property for herding and safety. If the pilot project proves successful, we are looking at other sites for the goats. The Fire Department recently received permission by the Canalways property owners to initiate an important fire safety related public/private partnership involving vegetation management with the use of goats. This pilot project has two phases and involves a total of 25 acres of overgrown land. As we all know, this area has a complex history and has been problematic for the city and public safety personnel. Goats are extremely effective in this type of terrain and fuel (food) mix where they will conduct targeted grazing to reduce the significant fire hazard present on the western edge of the Canalways property. One of several residual benefits of the pilot project in addition to firefighter and community safety will be the reduction in mass of the tall, dense invasive plants that have been used for unlawful camping. Such activity is dangerous and has been the source of multiple fires in the area. We also received approval from the property owner to post formidable “No Trespassing” signs around the perimeter of the property. This action will improve notification, enforcement and community safety. I have lived in the Dominican neighborhood of San Rafael for 16 years. Last week I hired two homeless men to come and spend the morning clearing my yard. This is how it came about. I met Andrew Hening, the Regional Director of the Downtown Streets Team, at Aroma Café a few weeks back. He is a young, energetic, enthusiastic man, eager to talk about the successes of the program. DST just celebrated 1 year in San Rafael and has seen a lot of success since their launch. 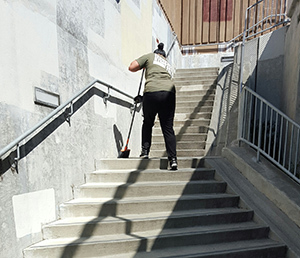 The Team of 25-30 people work an average of 400 hours a week cleaning up our downtown, working with merchants on their specific needs and even discouraging loitering. They also help clean up during and after the Farmer’s Market. It is estimated 33% of the San Rafael homeless population has attended one of their weekly Wednesday meetings. Impressive. I read a lot of angry rants and black and white statements about the homeless on NextDoor.com. From “put them on a bus and send them away” to “they are ruining our city”, and everything in between. Unfortunately, the face of the homeless is often the person ranting outside Starbucks with soiled clothes asking for money. It scares people and they just want this taken care of. I get that. But these are people and the face of the homeless is much broader than this. This is a complex issue with many moving parts. Andrew talks about the difficulty of being homeless. It is depressing. While there are people with mental illness and addiction issues, there is also a larger percentage of people who simply lost their job and had no safety net of family or money to bridge the gap until another job could be found. There are families living in cars with their children. There are elderly evicted from their homes with no place to go. I asked Andrew if it was possible for the DST to do yard work for local residents. He has been working on other work opportunities for the Team hoping DST can become self-sustaining in a few years. When I asked if I could be a pilot program for team members to help with yard work, he agreed. He said he would choose a couple of men to come over and help. The date was arranged and two men were driven to my house by Jaclyn, who works with Andrew, on a Thursday morning. I’ll call them Bob and Mike. Bob grew up in Novato, is in his fifties, five years sober, and most recently worked for a roofing company. The company had some issues and closed down 6 months ago. Previously he had made a living as a painter for a number of years. He has real skills. Bob is living in a shack (I assume that means no indoor plumbing) on his ex-employer’s property. He brought a bottle of water and a pear with him. Mike, a young man in his twenties, born in New Jersey, arrived with a coat, a satchel and a plastic bag. I told him we could put his stuff inside while he was working. I found out later in the morning that Mike sleeps on the doorstep of a church and stashes his sleeping materials during the day. The items he brought with him were his valuables. Mike told me he is writing a book and that he is a poet. He used to attend poetry slams in Denver and perform his poems. He hopes to publish an e-book combined with a multi-media presentation. He was smart, articulate and hoping to get back to Denver in a few years to see his Mom. These were two nice men. They worked hard. Bob has some physical issues but that didn’t stop him from pulling weeds. I worked with them the whole 3.5 hours until we had assembled 9 bags of clippings in neat rows to take to the dump. I paid them for 4 hours, $15 an hour, and they were so appreciative of having money as opposed to gift cards. I drove them downtown and they talked about food the whole way. What was good to eat at the Farmer’s Market, how expensive everything was and what kinds of gift cards they get for their work. Bob asked to be dropped off for lunch at St. Vincent’s. Mike got out of the car at the same spot but I think was looking to buy lunch elsewhere. I thanked them both. I told Mike to keep writing and hold onto his dream. We all have projects and need help. This is a way for you to get some help in your yard and make a difference in someone’s life. If you are interested, contact Andrew at Andrew@streetsteam.org. I had originally arranged coffee with Andrew to get his perspective and understand his corner of the homeless issue. There are a couple important points Andrew made in our conversation. First, many of us were raised in an environment where we saw our parents go to work on time, were expected to do our homework before TV, and rewarded for our successes. We had opportunities and learned our way in the work world, how to act, how to dress, how to communicate, how to care for not only ours, but other people’s property. Not everyone grows up with these gifts we take for granted. For some (not all) of the homeless, just learning to show up at a job is a success. The Downtown Streets Team is an opportunity to learn to show up, do your job and get rewarded with pay, in the form of gift cards. The DST program also helps people then find a real job but it doesn’t stop there. Andrew explains they are the bridge between homeless and permanent housing/independence. When a team member gets a job, the involvement doesn’t stop there because they are still ON the bridge, not on the other side. So they stay in contact, they support, they mentor and if necessary, even intercede with an employer to keep the person on the job to help them get into the rhythm of this new life. Andrew explains this is not an easy process or an easy solution. Every person is different. That was the second important point he made. Some people have a job, but just need a place to live or the rent deposit to get an apartment. Many people simply need a job that pays enough to afford to live in Marin (pretty hard). Others need medical care, mental health care, treatment for addiction. Some people have ongoing legal issues or they need a phone, an address for a job application, and on and on. The needs are varied, broad, but manageable. Bottom line is that it is one person at a time. On Thursday, July 10, 2014 the Citizens Advisory Committee on Economic Development and Affordable Housing held a community meeting on the status of the City’s Homeless Action Plan. The meeting included comments the Downtown Streets Team, an employment program for homeless persons. The San Rafael Police and Fire Departments reported on fire prevention efforts and encampment removal to keep open space safe. These are my notes from the meeting and not intended to be perfect or thorough. You can comment at the bottom of the story or email me. The photos in this story are © Larry Luckham from the San Rafael Fire Department. You can go to http://www.srphoto50.com and see SRFD fire responses. Chief Gray spoke about the Wildland Urban Interface program, which requires private and public land owners to keep defensible space on their property. The City has spent $111,180 to clear 161.5 acres of vegetation, including space in the Dominican neighborhood. This is a multi-agency effort including Dept of Public Works, Community Development agency, Cal Trans, Marin County, State Parks, etc. Chief Gray says they are contracting with a goat vendor to bring in 500 goats to clear vegetation. Apparently they have done this before. The first area of focus will be the canalways near the new Target/Home Depot area, where there have been a number of fires due to homeless camps. For more information on how to create your own defensible space, visit www.readysetgo.com. Additionally, you can call the Fire Department if you want a firefighter to come to your house and advise you on what to do to make your home easier to save in a fire. I’ve done this and it is very informative. Chief Gray also has funding to help neighborhoods with Chipper Days and has already completed a number of them, with more in planning stage. Three causes of fire: men, women and children. Clear your yard, take care with gas powered tools outside. If you see a camp, get to a phone and call 911. The dispatchers are prepared for these calls. They will get to the camp quickly. 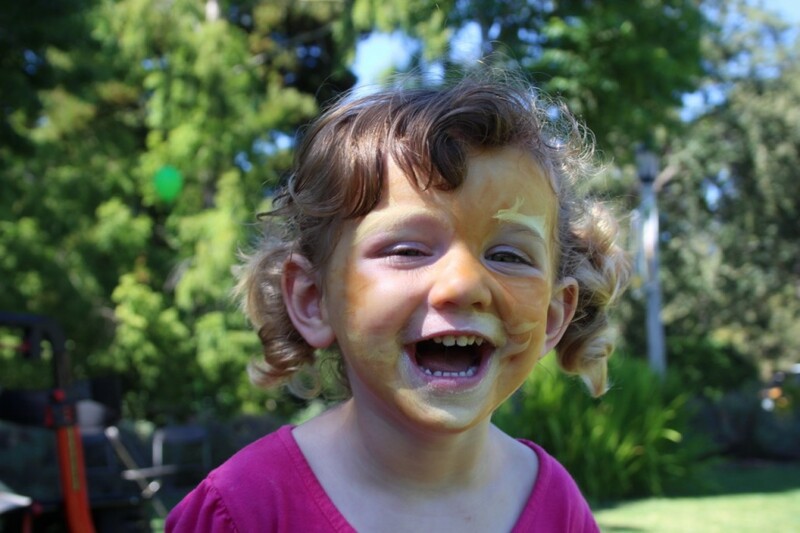 There is a no tolerance policy for camping in San Rafael. The only legal place to camp is in designated camping sites in China Camp. Lt. Pata grew up in San Rafael and has been on the police force for 30 years. He explained the difference between encampments and camps. An encampment is where a number of homeless camp and create a community. He says they might see 2 of these a year. Mostly they find camps, which have bags of belongings, sleeping bags, cardboard. Ten years ago he said they might find 12 encampments a year–so the number of those has definitely gone down. Being homeless is not illegal. Pan handling is not illegal except near an ATM and at entrance/exits to a freeway. Abusive language is not illegal unless it results in a fight. SRPD has the most officers in the County who have attended a 3-day course in crisis intervention. 3 foot patrol officers (and sometimes on bikes) Downtown and 1 mental health liason. There are homeless people who are not okay, tired, mentally ill. The SRPD works to direct these people to services. Their goal is to get people to behave properly within the penal code. Giving them citations is a useless approach because they have no money so it’s not an incentive to behave better. Unfortunately getting arrested is an entry point to healthcare in Marin County. Lt. Pata knows some residents are afraid to be downtown. He acknowledges that if your perception is that you are in danger, then it is real for you. However, after 30 years in San Rafael he thinks it is not dangerous downtown, though San Rafael has seen better days. He said the City goes through 5-10 year cycles of it being great, then gets worse, then gets better. 1500 are considered homeless which includes people who are living with friends/couch surfing but have no permanent home. 300 of these are considered “permanently homeless” defined as living without a home for over a year. 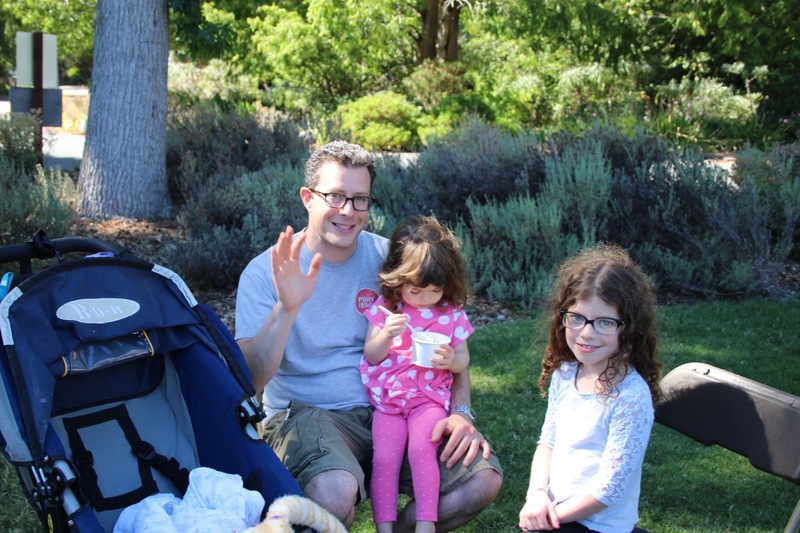 Peter noted that 75% of Ritter clients are long-term San Rafael residents. Ritter provides mental health counseling (5 counselors), medical services, laundry, showers and some food. Ritter is looking for another location but has had several landlords already turn them down. They are looking in the Kerner Blvd/Canal area. There was a discussion about whether moving Ritter affects the Downtown since people would still go to St. Vincent’s to eat, could be shuttled to the Downtown area, etc. Clearly it is complicated. Peter also pointed out that if you can prove your homelessness, you are eligible for Marin County general assistance (welfare). Andrew Hening spoke about the DTS and their success. 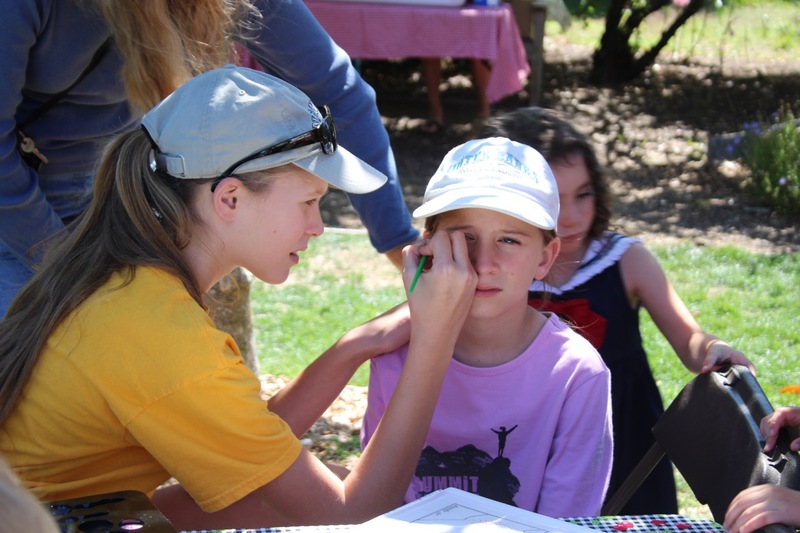 They are funded by organizations such as Marin General Hospital, Marin Community Foundation, Kaiser Permanente, and the City of San Rafael (which provided $53k to the program in its first year). The contract is coming up for renewal. The goal for the program is to be self-sustaining by the 3rd year. Want to get contracts for work that could supplement the non-profit/government support. 70 people have been through their program. In their weekly Wednesday meeting they have had up to 190 people attend. This points to the interest within the homeless community to find a way out of their situation. He reinforced that a lot of people are from San Rafael and Marin in their program and this is a way for them to return to the community. People who are homeless have low self-esteem, are at rock bottom. The Downtown Streets Program brings up their self-esteem, and improves their chance of getting back to a productive life. Get the Pampas Grass Out of Dominican! Please join us in ridding Dominican of invasive pampas grass. 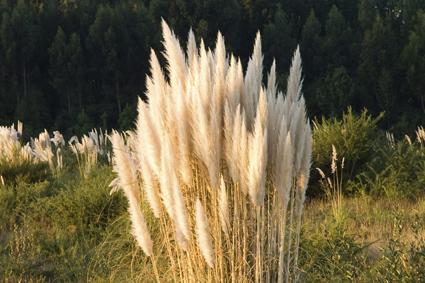 Pampas grass is one of Marin’s top ten invasive plants, and we still have many of them in Dominican, one of Marin’s most beautiful garden neighborhoods. These showy plants have dramatic feathery fronds, but they are thugs in our parks and wildlands, crowding out native plants and providing abundant dead vegetation for wildfires. Each frond produces thousands of tiny seeds that can be carried for miles by wind, water, wildlife, and vehicles. Individual plants and clusters are found throughout Barbier Park, Dominican’s own wildland, including on the top of the summit ridge, far from any obvious seed source. City parks invasive plant volunteer Paul Minault is determined to remove all pampas grass from the park, but he can’t do it if plants in Dominican continue sending seeds up into the hills on windy days. 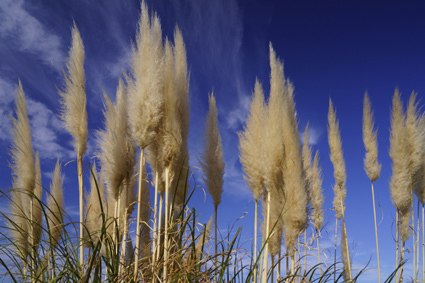 So please have your landscaper remove any pampas grass on or around your property. Please make sure that they first cut and bag the seed-carrying fronds and put the bag in the trash, not the greenwaste. This way, the seeds will be buried in the landfill, not blown into the road as your landscaper drives away with the waste in his truck, or as green waste is hauled to Marin’s out-of-county greenwaste facility and pulverized in huge hoppers for mulch. 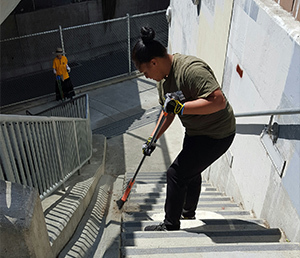 For a free consultation or free pampas grass removal, or to report pampas grass in a waste place near you, please contact parks invasive plant volunteer Paul Minault at 415-971-4090, pminault@earthlink.net. Thanks! 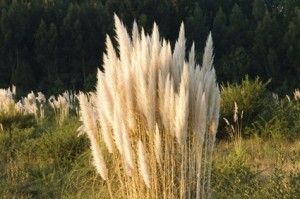 To learn more, Google “pampas cal invasive“.